McRib Hunting...People Actually Do This? The McDonald's McRib, it's a delicious and elusive boneless pork sandwich, that's only sold in a limited time fashion across the United States. In reading an article posted on the Chicago Tribune website this morning (see original article here), it's amazing to me that this seemingly normal item is one of mythical legend. There is much internet hype around a McDonal's Twitter post today: "Turns out we're not good at keeping secrets. The rumors are true. McRib returns Nov. 2 for a limited time"
Originally launched in 1981, these sandwiches are almost never available at all locations at the same time and are rarely sold for longer than a couple weeks at a time. Being that I've lived my entire life in the Chicagoland area, I never knew this was such a limited time item such as the Shamrock Shake and thought it was sold year round. Maybe it's just because we are the home base for the golden arches, we always seem to have it sold at a location close to us. The article continues on with multiple accounts of McRib lovers driving anywhere from ten hours away to riding trains to locations based on reports of the item being sold there. These "McRib Hunters" are using a secret weapon, the "McRib Locator". Hosted by Alan Klein, a meteorologist from Minnesota, the McRib Locator shows recently reported McRib sightings and allows visitors to submit their own sightings. I'm usually not one to drive extreme distances to find my favorite meal (Mongolian BBQ in Naperville or Flat Top Grill in Evanston are my two favorite meal drives), but after seeing that someone spotted the McRib being sold in Evanston today...I might have to make an exception and go "McRib Hunting" myself (especially after writing this post, I doubt I'll be able to make it to November 2nd). What's the farthest you have traveled to find your favorite food item? 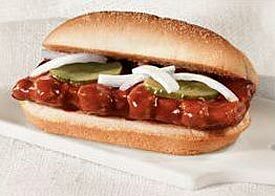 I think that the report of a McRib sighting in Evanston is some sort of joke. If you look at where it is located, there is no McDonald's there. Instead, there is a synagogue! I believe these people are "copying" an episode of "The Simpsons". Remember, Homer almost missed Lisa's spelling bee contest because he had to search fo the last Rib Sandwich that Krusty's was selling.